The prime minister's remarks come a day after Aiyar set off a political firestorm when he called Modi a 'neech kism ka aadmi'. BHABHAR: Prime Minister Narendra Modi today accused suspended Congress leader Mani Shankar Aiyar of giving 'supari' (contract) while on a visit to Pakistan to get him "removed" from the way to ensure peace between India and the neighbouring country. Targeting the diplomat-turned politician for the second time in two days after the Congress leader's 'neech aadmi'(lowly person) jibe at him yesterday, Modi also alleged that the Congress tried to suppress this episode and did not take any action against Aiyar. Attacking the Congress over its work culture, Modi alleged that the party believes in--'atkana' (to stall) 'latkana' (to keep the issue hanging) and 'bhatkana' (to divert an issue). The prime minister's remarks come a day after Aiyar set off a political firestorm when he called Modi a "neech kism ka aadmi". The Congress yesterday suspended Aiyar from the primary membership of the party and issued him a show cause notice for his remarks. "Shriman Mani Shankar Aiyar...you know what he did?" Modi asked a gathering of people in this small town of Banaskantha district in North Gujarat. "He gave this 'gaali' (abuse) to me or you? Did he abuse me or Gujarat? Did he abuse the cultured society of India or me?" Modi asked. "Let us not talk about that abuse, as people of Gujarat will look into it and give a reply and they (Congress) will know the result on December 18," he said. "But, after I became prime minister, this man (Aiyar) went to Pakistan and met some Pakistanis. All this thing is available on the social media. In that meeting, he is seen discussing with Pakistanis that 'jab tak Modi ko raste se hataya nahi jata' (until Modi is not removed from the way), relationship between India and Pakistan cannot improve," Modi added. "Someone tell me what is the meeting of 'raste se hatana'. You had gone to Pakistan to give my 'supari', you wanted to give Modi's 'supari' (contract killing)," the PM said. However, people need not worry as 'Maa Ambe' (goddess) is protecting me, he added. "This conversation took place three years back. The Congress party had tried to suppress this episode...They did not take any action against him for last three years," Modi alleged. "What is my crime? This country's people have elected me in a democratic way, and you go to Pakistan and say that this man is coming in the way and remove him!" he said. Modi was referring to a controversy that had erupted in 2015 when Aiyar during a talk show in Pakistan had reportedly made the controversial statement. 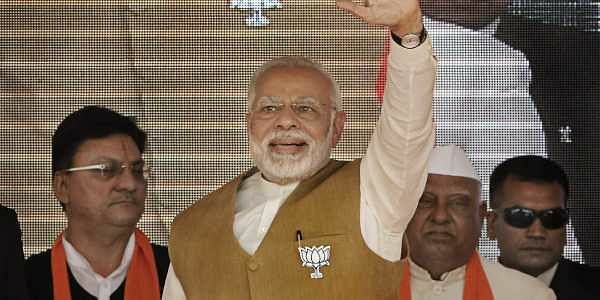 Yesterday, during a rally in Surat, he had said, "Shriman (Mr) Mani Shankar Aiyar today said that Modi is of 'neech' (lower) caste and is 'neech' (lowly). Is this not an insult to Gujarat?...This is a Mughal mentality where if such a person (who comes from a humble background) wears good clothes in a village, they have a problem." During today's rally, Modi further said the issue here is of Congress' mentality and the party's work culture means "atkana, latkana and bhatkana". "What Congress has done so far is-atkana, latkana and bhatkana. They will either stall, keep an issue hanging or try to divert it," Modi said adding that they are not interested in solving people's problems. When our brave jawans conducted the surgical strike then, I think that all the people of the country felt proud, but only Congress was not happy, he said. Would you believe Pakistan or India in such matters?" Modi asked.